Branched chain amino acids (BCAAs) have been used by top bodybuilders and other athletes for years due to their ability to support training endurance and recovery! BCAAs are comprised of three powerful amino acids – leucine, isoleucine and valine – and are perfect for any hard-training athletes because they serve as primary building blocks for muscle and help combat muscle loss and protein breakdown, especially during intense training. * And while many BCAA powders deliver these basics, most BCAA or amino powders are not based on scientific research, nor are they designed to enhance performance. MuscleTech® researchers knew this when they created the original AMINO BUILD® formula, and that’s why they engineered more than just another “me too” amino formula. Instead, AMINO BUILD was developed with elite athletes in mind and formulated with clinically researched ingredients that drive peak performance – including a massive dose of BCAAs, clinically researched doses of leucine, and betaine that other amino formulas simply didn’t have. Directions For Amino Build Next Gen : Mix 1 scoop with 8 oz. of water and consume pre- and intra-workout. 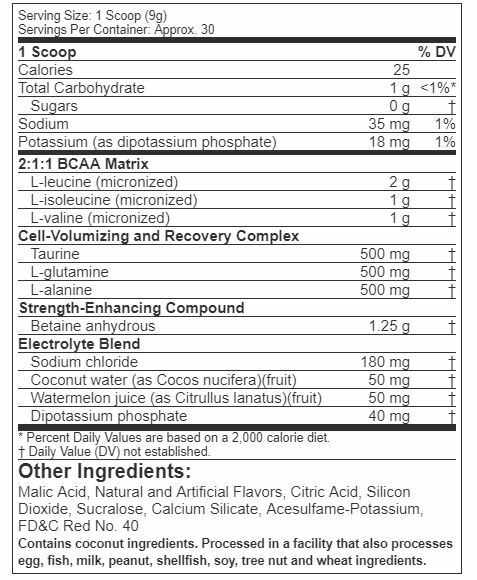 For full effects, mix 2 scoops with 16 oz. of water and consume during your workout. Read the entire label before use and follow directions provided. If you want to add to your overall daily BCAA intake without the additional calories from drinking multiple protein shakes, you can also add 1 to 2 scoops to a jug of water and drink it over time.